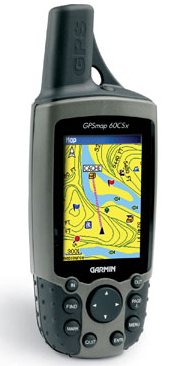 The GPSMAP 60CSx is a refreshing upgrade of the GPSMAP 60CS, one of our most popular models for outdoor and marine use. This unit features a removable microSD card for detailed mapping memory and a waterproof, rugged housing. The microSD card slot is located inside the waterproof battery compartment. Users can load map data and transfer routes and waypoints through the unit's fast USB connection. In addition, this unit features a new, highly sensitive GPS receiver that acquires satellites faster and lets users track their location in challenging conditions, such as heavy foliage or deep canyons. 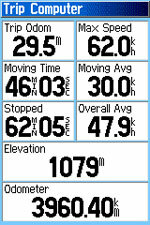 The GPSMAP 60CSx also incorporates a barometric altimeter for extremely accurate elevation data and an electronic compass that displays an accurate heading while standing still. Considered the mainstay among serious outdoor enthusiasts, the GPSMAP 60CSx and GPSMAP 60Cx offer a large color TFT display and turn-by-turn routing capability. Each unit comes with a blank 64 MB microSD card. Owners of these new x-series handhelds can also purchase new microSD cards that are pre-loaded with MapSource Topo and inland lake maps, BlueChart marine cartography, and City Navigator street maps. The device features the powerful SiRF GPS navigation chip for supreme accuracy in all conditions. You also get an electronic compass and a barometric altimeter. You also get a large color TFT display and turn-by-turn routing capability. The 60CSx is a refreshing upgrade of the 60CS, and features a removable microSD card for detailed mapping memory. View larger. You can use the 60CSx's memory card slot with preprogrammed microSD cards from Garmin (sold separately) that provide topographic maps, city streets, and nautical charts. In fact, the unit is compatible with most Garmin MapSource products including BlueChart, City Navigator, U.S. Topo 24K, and U.S. Topo and Recreational Lakes with Fishing Hot Spots. The unit comes preloaded with an Americas autoroute basemap that provides automatic routing capabilities including highways, exits, and tide data. There's also a preloaded marine point database. You can even get turn-by-turn directions when you're driving, and an integrated trip computer provides odometer, stopped time, moving average, overall average, total time, max speed, and more. The 60CSx's 2.6-inch, 256-color TFT color display is designed to present mapping and trip information clearly and accurately in any lighting conditions. Plus, the case is lightweight, rugged, and water resistant to IEC 60529 IPX7 standards (can be submerged in one meter of water for 30 minutes). When using two AA alkaline batteries, you'll get up to 20 hours of battery life from the unit. The unit's barometric altimeter system features automatic pressure trend recording while providing current elevation, ascent/descent rate, minimum/maximum elevation, total ascent and descent, and average and maximum ascent and descent rate. Meanwhile, the electronic compass allows you to get accurate headings while standing still. Another key feature of the 60CSx is the 10,000 point automatic track log; 20 saved tracks (500 points each) let you retrace your path in both directions. There's also a large-numbers option for easy viewing, as well as a dual-position display mode. 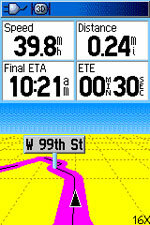 The 60CSx's trip computer provides odometer, stopped time, moving average, overall average, total time, max speed, and more. Meanwhile, a fast processor allows the 60CSx to provide quick auto-routing, turn-by-turn directions, and audio alerts when you use the optional MapSource software, which can be stored on the unit's included 64 MB microSD card. Downloading information is quick with the USB or serial port interfaces. Using the dedicated serial port, the 60Cx can share navigation instructions with repeaters, plotters, and autopilots. The four-position rocker pad and dedicated high-use buttons make navigating through the unit's features easy, even when your fingers are cold or wet. Finally, the GPSMap 60CSx is packed with some extra fun features. An integrated outdoor calendar provides ideal hunting and fishing times, plus moon rise/set/location information. There is a dedicated geocaching mode for those of you into the hot GPS community treasure hunt game. Finally, there are indoor/outdoor GPS games to help you and your friends enjoy the outdoors. If you like the features of the 60CSx, but don't need an electronic compass and a barometric altimeter, check out the Garmin 60Cx. 60CSx unit, 64 MB microSD card, belt clip, USB interface cable, MapSource Trip and Waypoint Manager CD, lanyard, owners manual, and quick-start guide.